Seventeen-year-old Miho has spent years struggling to deal with the aftermath of a tragic accident. Between the nightmares, PTSD, depression, and her parents’ abandonment, the burden of being the sole survivor has her near her breaking point. The darkness whispers to her, promises of release from the pain, from being a burden, if she is willing to give up. While the girls love classmate Shinji’s blond hair and blue eyes, to his father it’s all the proof he needs that his wife was unfaithful. Unwanted and unloved, Shinji is used to his mother’s hatred, his brother’s indifference, and his father’s violence. Male or female, he doesn’t care; his regular string of sexual partners helps him temporarily forget that he will soon have to leave the only person he loves, if he can survive that long. As the first-born son, Shinji’s best friend Taka has known from birth that his future was not his own. He’ll go to the right schools, get the right grades, take over the family business, and produce a perfect heir with a perfect wife, just as his father dictates. Taka’s wants and desires are irrelevant; he can’t change his fate nor escape it, any more than he can protect the only person who keeps him sane. Drawn to one another like moths to a flame, the three find themselves torn between what society deems acceptable and a happiness they never dreamed existed. 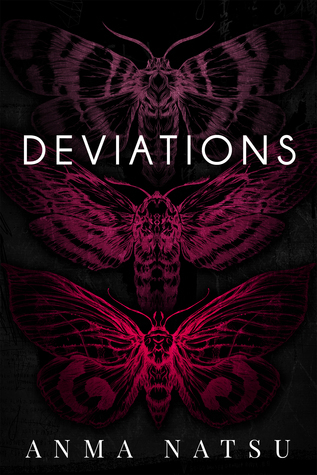 You can request a review copy of Deviations here! It’s funny how I never noticed till now. Miho, I mean. I’d talked to her a few times in the library, though only to exchange the usual greetings and perform book transactions. But we hadn’t really talked, not until Taka approached her. Then watching her, I realized she was like me. Her eyes had that same deadness to them. Did her preference for long clothes make it easier to cover bruises, like I had to? Was she always alone because it was easier—easier to hide the shame and the pain if you had no one around? Now that I’d acknowledged it, I was hyperaware of it, looking for more clues. When she checked me out at the library, I thought I spotted a white scar on her wrist. I wanted to ask her, ask her about all of it, but that would have been crass. You never talk about that sort of thing in public, and not with strangers. We were still strangers, after all, even if we had the darkness in common. After leaving the library, I’d taken the books to our hideout before heading back into town. I never took the books I got home out of fear something might happen to them. It was one thing when they were my own books, but letting my dad destroy other people’s property, much less community property, would be pretty crappy. So I kept them safe where only Taka and I could find them. I was heading home when I spotted her walking across the river from me. I don’t think she saw me before that pack of girls surrounded her. It was clear they’d been lying in wait. I leaned on the rail and watched them with an odd sense of pride in Miho for not crying. She was used to it, like I was. People like us, we learn how to endure. Crying, appearing weak, it only gets them going worse, feeding on whatever it is inside them that makes them have to hurt others. Miho only broke when they stole the scarf we’d picked out for her. That bothered me a little. Though I knew it was better not to interfere, I moved towards the bridge to cross to the other side. I was halfway across when the scarf hit the river and Miho was left there to watch it float away. Only she didn’t. She dived into the water without hesitation. I ran, scared she would drown. All those heavy clothes could easily pull her under, but when I reached the bank I realized she was swimming. Her arms breached the water at her side before slicing back into the water above her head like a professional. The only difference was her legs stuck straight out behind her instead of kicking. Smart girl. Then she was back at the bank and lying on top of me, both of us panting even though she’d done all the work. Her body was thin, but soft and warm. Her chest was small, a B cup at best, but more likely an A. Still, they felt nice. She felt nice. 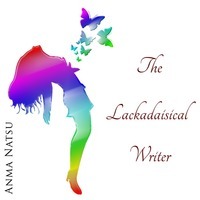 Anma Natsu is a Texas-based writer of stories that explore love in its various forms, including how it can be both good and bad parts of our lives, sometimes at the same time. Her not quite conventional stories span a range of genres but rarely follow the standard fare. When she isn't writing, writing, voraciously reading manga and light novels, playing too many video games, and hosting her own podcast, Anma works as a web developer and steals all the free time she can to snuggle with her sweetie and her pets. You can find her online at AnmaNatsu.com. She's also active on Facebook, Google+, and Goodreads.